Marie Kondo, a Japanese organising consultant, recently sprang to fame with her Netflix show, ‘Tidying Up with Marie Kondo’. Each hour-long episode sees Kondo visiting a different American household with a cluttered or disorganised home, in order to help the family establish order amidst chaos. 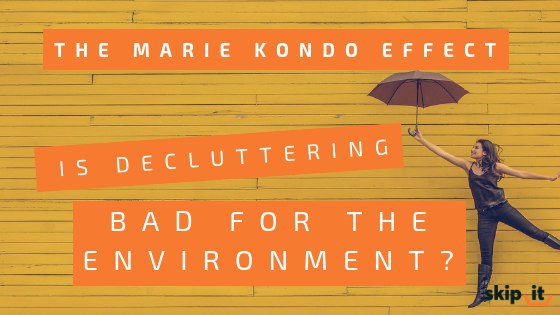 Kondo has also written four books on decluttering, which have sold millions of copies around the world. Her most popular book, ‘The Life Changing Magic of Tidying Up’ (2011), has been published in more than 30 countries. She was also listed as one of Time Magazine’s most influential people in 2015. What is the ‘KonMari’ technique? The ‘KonMari’ method of decluttering sees Kondo encouraging people to gather together the objects they own into categories, before holding each one in turn, in order to decide whether or not it ‘sparks joy’. Those which do should be kept, the others discarded. Kondo’s technique is partly inspired by the Shinto religion, in which cleaning and organising things can be a spiritual practice, concerned with the energy or the divine spirit of things (kami) and the right way to live (kannagara.) Kannagara involves treasuring what you own and treating objects as valuable, rather than disposable. How can I ethically dispose of objects that don’t spark joy? The KonMari philosophy resonated with many, sparking a mass decluttering across the UK and the US. Some, however, have expressed concern that unwanted objects from such clear-outs are not being disposed of responsibly, going against one of Kondo’s key principles. Happily, the vast majority of items you’ll be clearing out can be passed on to others or recycled, rather than becoming landfill. This guide covers how you can ethically rid yourself of items that no longer bring you joy. Donations of clean, good quality men’s, women’s and children’s clothing can be made to your local charity shop, along with paired shoes and accessories like bags and belts. Most charity shops are also happy to accept clothing that is torn or stained, as these ‘rags’ can be recycled by weight, making a little extra income for the cause. Some high-street shops offer discount schemes for clothing donations – If you take a bag of unwanted clothes to any branch of H&M, for example, you’ll receive £5 off your next £25 spend. There are also many textile recycling points across the UK, where used clothing can be taken for recycling. Finally, if you have a large amount of clothing an no transport, we can arrange to collect an ethically dispose of this on your behalf. Get in touch for a quote. After clearing out their unwanted clothing, fans of the KonMari technique often find themselves with bags of coat hangers to spare. As these can be surprisingly expensive to buy new, try offering them to friends and family, or contacting local charity shops, independent clothing shops or dry cleaners – you might find a donation is welcome. Some council run waste management centres accept metal, plastic and wooden hangers for recycling, even if these are broken. Items of furniture, in a good state of repair, can often be sold on eBay or Gumtree, with the buyer collecting to save you any hassle or transport costs. They can also be given away via Freecyle or Freegle. Some charities, including the British Heart Foundation, have dedicated furniture shops and offer a free pick-up service for donations. Furniture that’s damaged or broken can often be recycled, especially if it’s made from wood or metal. Some councils offer a free pick up service for larger items. If you have transport, you can also drop these at your local your local waste management centre. Alternatively, our house clearance service and Wait & Load will take away large items like furniture and carpet along with electrical items, white goods and more – all on a day and time that suits you. Books should not be placed in green household recycling bins, due to the glue that’s used in the binding process. Unwanted books can be taken to your local charity shop or donated to local schools and nurseries. As some charities have limited space, it may be sensible to take large donations to one of Oxfam’s dedicated bookshops. Kids grow up fast, making toys and games the obvious victims of a KonMari style clear-out. Outdoor equipment like swings and slides or bikes can usually be sold on sites like Gumtree, or on local Facebook selling pages. Local hospitals, hospices, playgroups, children’s centres and nurseries might appreciate donations of good quality toys and games, in great condition. It’s also worth asking friends and family with younger children if they’re in need of any items. Some household waste management centres accept toys and games for recycling but check in advance before making a trip. Bits and bobs may no longer spark joy, but this doesn’t mean they should end up in landfill (one man’s trash is another man’s treasure). Many charity shops accept donations of bric-a-brac, but it’s worth phoning in advance to check, as storage and display space is often limited. Car boots sales are also a great place to rid yourself of clutter, while adding the chance to make a bit of spare cash into the bargain. Most charity shops will accept donations of jewellery, providing it isn’t broken, tangled or missing stones. Some larger charities, including Marie Curie and Oxfam, are sometimes open to accepting donations of broken jewellery.